Armbrister Pyrotechnics, a manufacturer of fireworks and lasers for light shows, has identified 40 potential independent projects, with 15 having a positive NPV based on the firm's 12 percent cost of capital. The total cost of implementing these 15 projects is $75 million. Based on finance theory, the optimal capital budget is $75 million, and Armbrister should accept the 15 projects with positive NPVs. However, Armbrister's management has imposed a limit of $50 million for capital expenditures during the upcoming year. Due to this restriction, the company must forego a number of value-adding projects. This is an example of capital rationing, defined as a situation in which a firm limits its capital expenditures to less than the amount required to fund the optimal capital budget. Despite being at odds with finance theory, this practice is quite common. 1. Reluctance to issue new stock. Many firms are extremely reluctant to issue new stock, so all of their capital expenditures must be funded out of debt and internally generated cash. Also, most firms try to stay near their target capital structure, and, combined with the limit on equity, this limits the amount of debt that can be added during any one year. The result can be a serious constraint on the amount of funds available for investment in new projects. This reluctance to issue new stock could be based on some sound reasons: (a) flotation costs can be very expensive; (b) investors might perceive new stock offerings as a signal that the company's equity is overvalued; and (c) the company might have to reveal sensitive strategic information to investors, thereby reducing some of its competitive advantages. To avoid these costs, many companies simply limit their capital expenditures. However, rather than placing a somewhat artificial limit on capital expenditures, a company might be better offexplicitly incorporating the costs ofraising external capital into its cost ofcapital. Ifthere still are positive NPV projects even using this higher cost ofcapital, then the company should go ahead and raise external equity and accept the projects. See the Web Extension for this chapter on the textbook's web site for more details concerning an increasing marginal cost ofcapital. 2. Constraints on nonmonetary resources. Sometimes a firm simply does not have the necessary managerial, marketing, or engineering talent to immediately accept all positive NPV projects. In other words, the potential projects are not really independent, because the firm cannot accept them all. To avoid potential problems due to spreading existing talent too thinly, many firms simply limit the capital budget to a size that can be accommodated by their current personnel. 3. Controlling estimation bias. Many managers become overly optimistic when estimating the cash flows for a project. Some firms try to control this estimation bias by requiring managers to use an unrealistically high cost of capital. Others try to control the bias by limiting the size of the capital budget. Neither solution is generally effective since managers quickly learn the rules of the game and then increase their own estimates of project cash flows, which might have been biased upward to begin with. A better solution is to implement a post-audit program and to link the accuracy of forecasts to the compensation of the managers who initiated the projects. 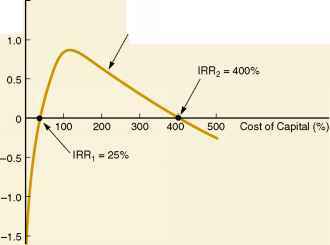 What factors can lead to an increasing marginal cost of capital? How might this affect capital budgeting? What are three explanations for capital rationing? How might firms handle these situations? 17See Stephen P. Bradley and Sherwood C. Frey, Jr., "Equivalent Mathematical Programming Models of Pure Capital Rationing," Journal of Financial and Quantitative Analysis, June 1978, 345-361. Why are companies are reluctant to implement any capital improvements or capital expenditures? How to avoid estimation bias when making capital investments? Why companies are reluctant to implment capital improvement?